PHOTO BY JACOB GURNEY Sue Gaietto, a McDonald’s employee for 44 years and general manager of the Tiffin McDonald’s, works her final day at the restaurant, 1714 W. Market St., today. 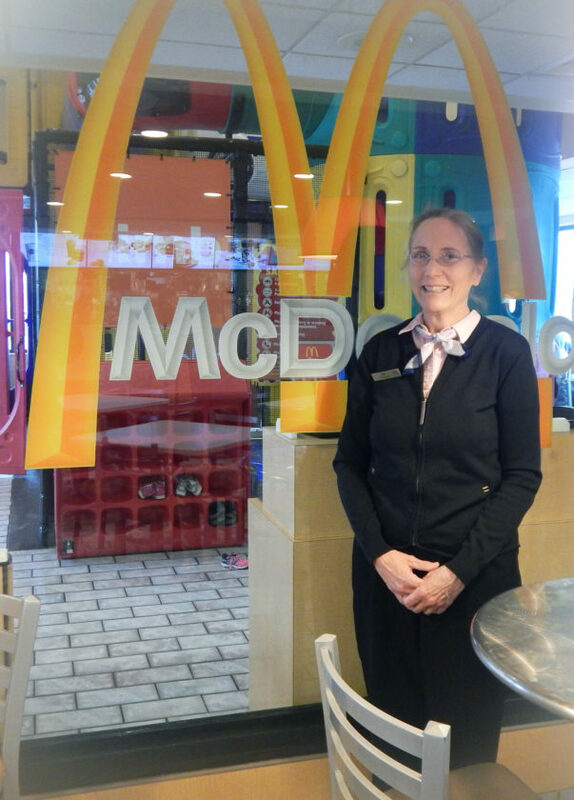 A 44-year employee of McDonald’s is working her final shift today. General Manager Sue Gaietto said she began working at McDonald’s a couple of months before she graduated from Columbian High School in 1974. She said she began working there to earn money to buy a horse and became an assistant manager in her first year. She said once you start earning money, it is hard to walk away. Gaietto was an assistant manager for a few years before she went to Florida in 1978 and 1979 and worked at a couple of McDonald’s there. She said she returned to the Tiffin McDonald’s as an assistant manager and, in 1983, was promoted to general manager, a position she has held since. Gaietto said it was fun to take a “not-that-busy McDonald’s” and turn it into one of the busiest McDonald’s in the area. The Tiffin McDonalds was built in October 1973 at 435 W. Market St. and moved to its current location, 1714 W. Market St., in August 1987, she said. “One of my best friends worked here and that is kind of how I got here,” Gaietto said. She said a lot of things have changed since she started working. In the past, multi-mixers were used to spin milkshakes, ice had to be put into cups, pop had to be drawn and workers wore headsets that attached to a belt. When she started, biscuits, tartar sauce and hotcakes were handmade, Gaietto said. She said she has enjoyed her job, although it is physically and mentally demanding. Gaietto said she doesn’t regret staying at McDonald’s. Gaietto said she has worked different shifts and plans to relax when she is retired. Gaietto said Tom and Luke Humbard, owner-operators of the Tiffin McDonald’s since 1998 and owners of 13 other McDonald’s, threw her a retirement party at Fremont Country Club Wednesday evening. A party bus picked her up at her house, she said. “I was shocked. I knew we were doing something, but I didn’t quite know what was going to happen. It was pretty cool,” she said. Brenda O’Donnell, operations supervisor of the Humbards’ 14 McDonald’s, said she was hired in 1978 when Gaietto was in Florida, but had heard many positive things about her. “When she came back, I understood everything they were saying about her,” she said. She said Gaietto’s consistency is what made her so good. O’Donnell said her daughter learned a great deal from Gaietto when she was assistant manager under her during college. “My daughter is a charge nurse for an emergency room in Cincinnati now and the first time I visited her, she said she runs things ‘like Sue does.’ She said Sue had taught her how to organize and prioritize. She really taught her a lot about management,” O’Donnell said. O’Donnell said it will be strange not having Gaietto around, but she knows Connie Nusbaum will do a great job. Nusbaum, who has worked at McDonald’s for 40 years and is to be the new general manager, said Gaietto has been a great boss and a great friend. Although she is a bit nervous, Nusbaum said she is excited to be general manager. Gaietto said she is glad she worked where she did all these years. Gaietto is to work her last shift 3 a.m.-1 p.m. today.